What is WEKAF? 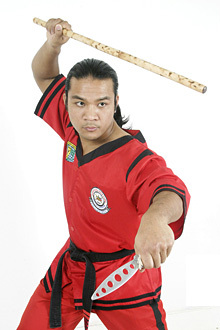 The World Eskrima Kali Arnis Federation (WEKAF) was formed in 1989 in Cebu, Philippines, to promote the Filipino martial arts (FMA) via a sporting version of eskrima (stickfighting) throughout the world. After failing to secure the title in their own backyard, the country's endless search for the overall crown in the World Eskrima Kali Arnis Federation (Wekaf) Championships will take them to Mexico, who won the right to host the biennial event in 2010 during the organization's world congress which was held last week. Carlos Hidalgo, the director for Wekaf in Mexico, was overjoyed to hear of his country's win in the bidding over Reunion Island. He promised an amazing time at Puerta Vallera, where he plans to hold the event. Puerto Vallera, is a pristine white-sand tourist destination facing the Pacific Ocean and is considered to be Mexico's equivalent to the Philippines' Boracay. He added that the event should be in Puerto Vallarta because it is a tourist spot and most people speak English. Hidalgo, a Psychology professor in University of Guadalajara, said that he will tap the University Sports Department. "When I get back home, I will then ask the Sports Department to fully support the world championship. The Sports Department is very experienced in hosting sporting events,” added Hidalgo. Team Philippines’ promising bid for the title it last held in 2000 got off to a rousing start as they captured 20 gold medals in the first day of action. However, the Pinoys eventually lost steam and ended up with just 35 gold medals, nine shy of the United States, who cruised to their third consecutive title with 44 gold medals. The Wekaf Congress also saw Master Gerald Canete elected as the new vice-president of the organization. Australian Sharon Burns was elected as the new president.